Japanese-Australian artist duo/couple Ken + Julia Yonetani display an uncanny sensibility in their artworks. By successfully bringing together their environmental and socio-political concerns with a sophisticated sense of elegance, the Yonetanis juxtapose the warmth of nature, the human touch of a ceramicist and the objectivity of science. 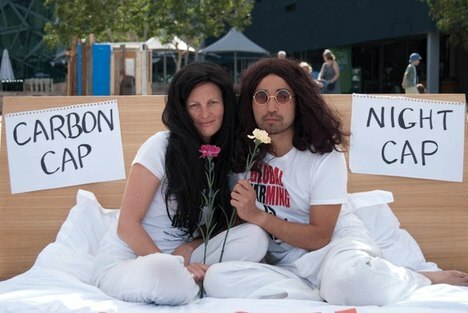 They represented Australia at the Venice Biennale in 2009 and recently exhibited at the Singapore Biennale in 2013. 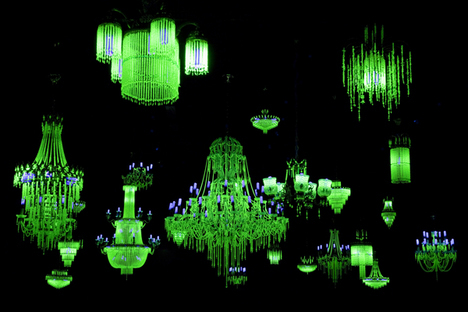 One of their most remarkable works, titled Crystal Palace, was an installation featuring glass chandeliers imbued with uranium – a work directly inspired by the nuclear disaster in Fukushima in 2011. Ken and Julia are currently exhibiting their “The Last Supper” installation, a still-life recreation of the biblical tale, built from scratch exclusively with salt. The exhibition is taking place at Hazelhurst Regional Art Centre, in Sutherland Shire, Sydney, until 18 May 2014. Starting from the beginning, about Julia: many years have you spent in Tokyo since you were born? How well do you speak Japanese and how do you relate to Japan nowadays. I only spent two years in Tokyo when I was young. I returned when I was 21 years old on a working holiday visa. I studied Japanese for two years, before entering a Masters course at Tokyo University. I actually then did a PhD in Japanese History, at the Australian National University, and returned to Japan for research and work. So my Japanese skills are near-native, and mostly gained after I became an adult, though Ken insists there was some subliminal part of my brain that held all the Japanese I learnt from my Japanese nanny at a very early age. Japan and I have always had a close relationship, obviously. Though also obviously I have always been an “outsider”. I think Japan has changed a lot in the last twenty years. It is far more common for Japanese people to meet foreigners who can speak Japanese these days, and so easier for them to relate more immediately on an intimate level. We have both also spent a long time in Okinawa, which gave us some space to see Japan from a different perspective, away from simplified dichotomies. Suddenly Ken was a kind of outsider too – a “Naicha”. Now we are lucky that we have opportunities to spend time in both Japan and Australia. It gives us an important perspective on both countries, a place somewhere in-between from where we can see the good and bad in everything. I understand that Ken was a “salaryman” before studying ceramics and deciding to study art at ANU – The Australian National University. What led him to become a ceramicist and contemporary artist? Tell us about the transition in careers and from Japan to Australia. It was lucky thing that I was able to come to Australia, if I had stayed a “salaryman” I might have ended up on the Yamanote Line tracks by now! Coming to Australia, I had a hard time, suddenly from dealing with billions of dollars and yen every day, in the complex derivative markets, I was washing dirty plates for $5 an hour at a Japanese restaurant owned by a Chinese-Australian. But through the freedom of dirty dishes, and no pressure from my parents or society, I was able to find art. Did the two of you met at ANU and how did your collaboration begin? We met way before ANU, in Tokyo in 1995. We were both working part time (Arubaito) at an Italian restaurant in Tokyo. Our collaborations officially began much later, in 2009, with the Venice Biennale as a kind of catalyst. I get an aesthetically pleasing feel from your work, in a sense that it abides to a classic sense of “beauty” or even “elegance”. The interesting point about it is the way it conveys its message to the audience. There’s a sense of gentle socio-political critique that gives the work a whole different sense of gravitas. Also can your work be described as the Japanese aesthetic term 風流 “furyu” (in its more traditional sense)? In its very original sense, “furyu” perhaps had a different meaning to “beauty” or “elegance”, and was more literally the meaning of its Chinese Characters – what was the trend of the time. This is perhaps meaningful in that while incorporating beauty and also a kind of socio-political or ecological critique, we also try to keep our work very accessible. Japan maintains within its highly complicated self a pervading critique of modernity, multiple layers of time, culture, and meaning that enable an understanding and aesthetic that is not completely overridden by contemporary materialism. At the same time, having one foot inside Japan and another outside it, in a country like Australia, enables a perspective that can question the worst of Japan’s essentialising and collectivist tendencies. It also seems type of material you want to work with (uranium, salt) dictates the topic and aesthetics of each artwork you conceive – as in its form, topic and the social implications it has (in the case of uranium it’s more apparent, salt not as apparent but in the context of the work its social commentary is quite clear). And there’s almost a Shinto way that your work relates to nature – in a sense that all these raw materials have a spirit – but at the same time many scientific ideas are also brought to the frame to complement it. What is your opinion of this interpretation? In terms of the materials, certainly we are kind of working backwards, in the sense that the material often comes first, before we have an sense of what form it is going to take. We like to see the artist as a kind of Shaman, and maybe the best way we are able to express that is through the spirit of the material. How was your experience at the recent Singapore Biennale and how has work been received there? We had an absolutely wonderful experience in Singapore. To be honest coming from Berlin, it made us realise that the “centre” of global culture really is no longer Europe. The Singapore Biennale has embraced the region in all its complexities and diversities in a very interesting way. Our work was extremely well received, in lots of the “top” lists, and also obviously gaining attention through the themes and materials it explores.